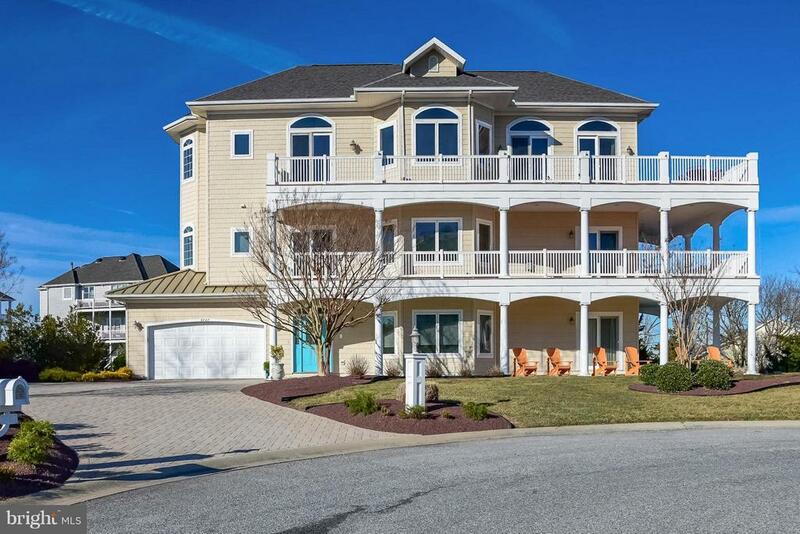 Luxurious 5BR/5 BA home in the prestigious neighborhood of Marthas Landing in desirable West Ocean City hits the market. This home has views of the Bay, the inlet and the Boardwalk, and has an elevator and a two car garage! This home has breathtaking water views throughout and is being sold fully furnished. As you walk into the home you see the fabulous decor, attention to detail and exceptional craftsmanship with custom finishes throughout. This is the perfect floor plan for large families and for entertaining guests. On the first floor there is a large great room with wonderful kitchen and a spacious bedroom and full bath. On the second level you will find a spacious oversize master bedroom with his and her closets, a fireplace and a glass slider leading to a beautiful wrap around deck. There are also two addition bedrooms each with a full bath. On the third level you will find yet another large bedroom and bath. The professional chefs kitchen is sure to please the cook in your family. There is plenty of storage and a large center island complete with granite countertops. The large dining area is off the kitchen and is perfect for enjoying dinner with family and friends. The large great room extends to the deck where you will enjoy endless sunsets and views of the inlet, the Bay and the boardwalk. The house also has a two car garage, a fire sprinkler system, wrap around decks, a paver driveway and an elevator. This home was constructed by Piney Island Builders. (HOA - pays for grass cutting and use of pool at Sunset) Come take a look at this incredible home today and make it yours! Directions: From Ocean City take Rt 50. Turn left at Golf Course Rd. Turn left onto Old Bridge Rd. Turn right onto Martha's Landing Rd. 9747 Martha's Landing Rd is at the end of the cul-de-sac on the left. Exclusions: Mermaid table, mermaid statue, garage contents (paddle board&kayaks), telescope, cameras, office equipment, binoculars, wii and personal items. See list on file. © 2019 Coastal Association of REALTORS All rights reserved. Information deemed to be reliable but not guaranteed. The data relating to real estate for sale on this website comes in part from the Broker Reciprocity Program. Real estate listings held by brokerage firms other than Holiday Real Estate are marked with the BR logo and detailed information about them includes the name of the listing brokers. Listing broker has attempted to offer accurate data, but buyers are advised to confirm all items. Information last updated on 2018-06-13.